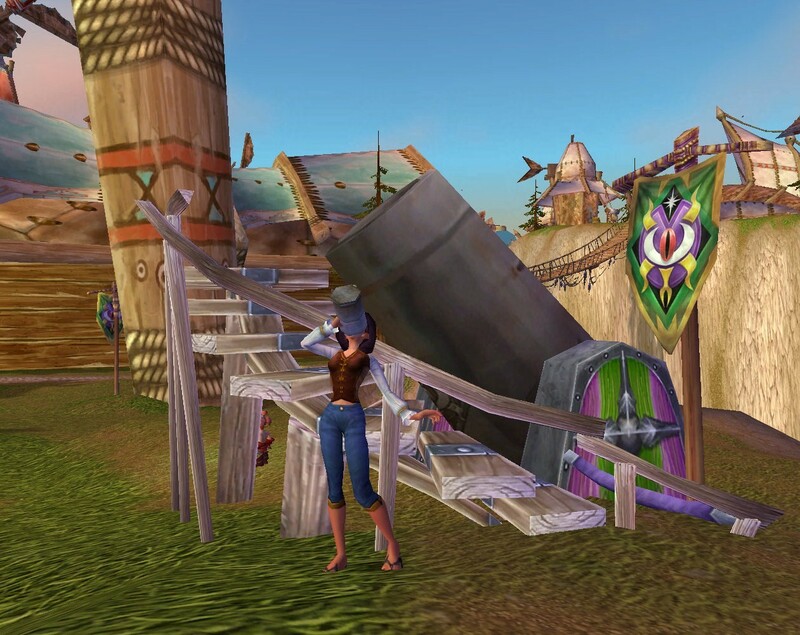 The Darkmoon Faire is in town again…mystical fortunes, fun rides, good eats and cold drinks. 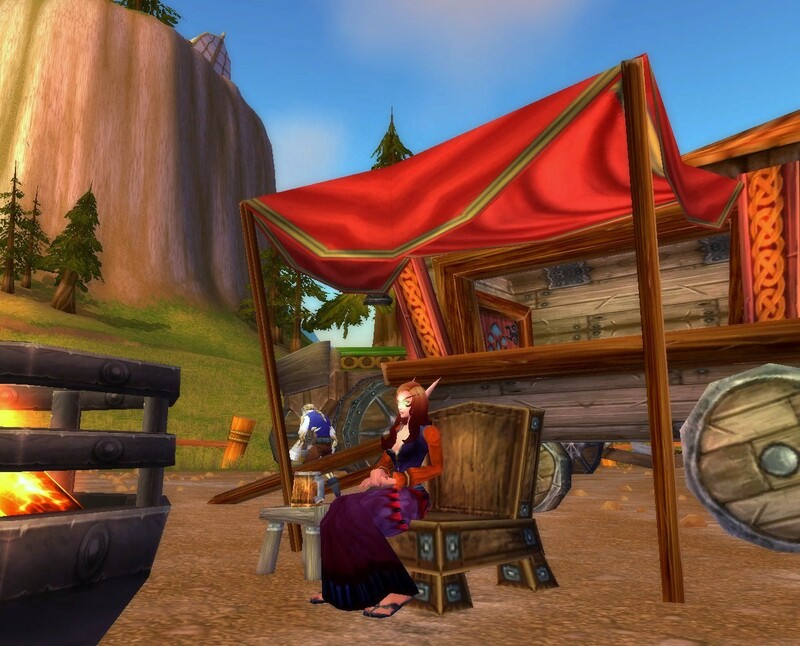 Be sure to attend this traveling fair in style! 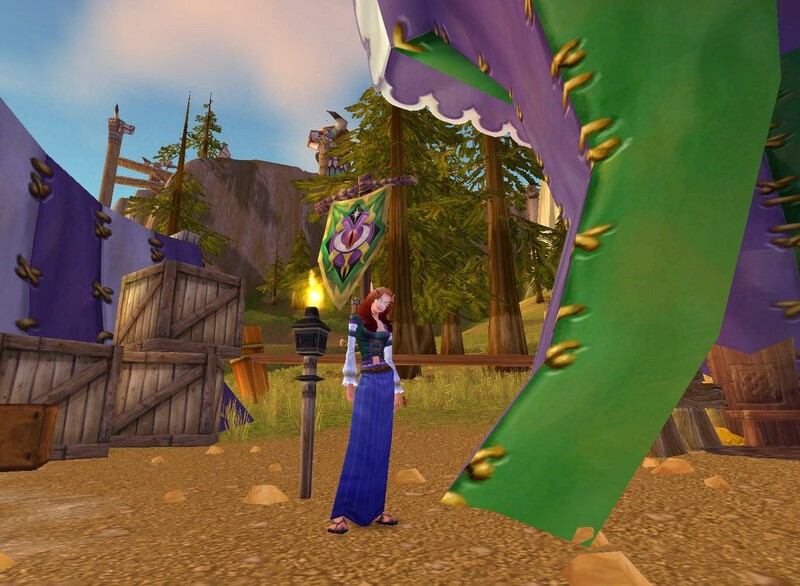 For more, I guess one could say, “formal”, fair outfits, I choose armor pieces with shades of purple and green to match the Darkmoon Faire’s color theme. 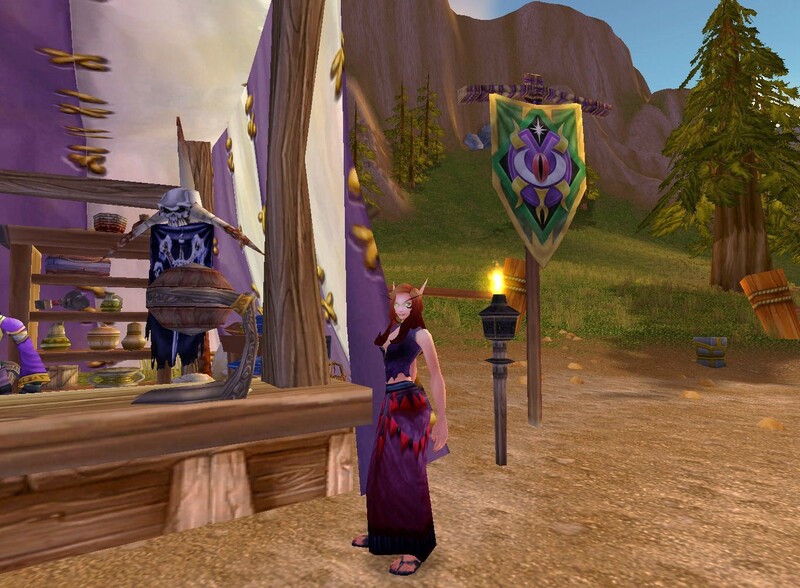 The Mystic Sarong is sold in limited supply by several vendors; I got Kirina’s from a tradeswoman out in Hillsbrad Foothills. I find it to be a very unique skirt, yet, very agreeable with a different array of chest pieces. 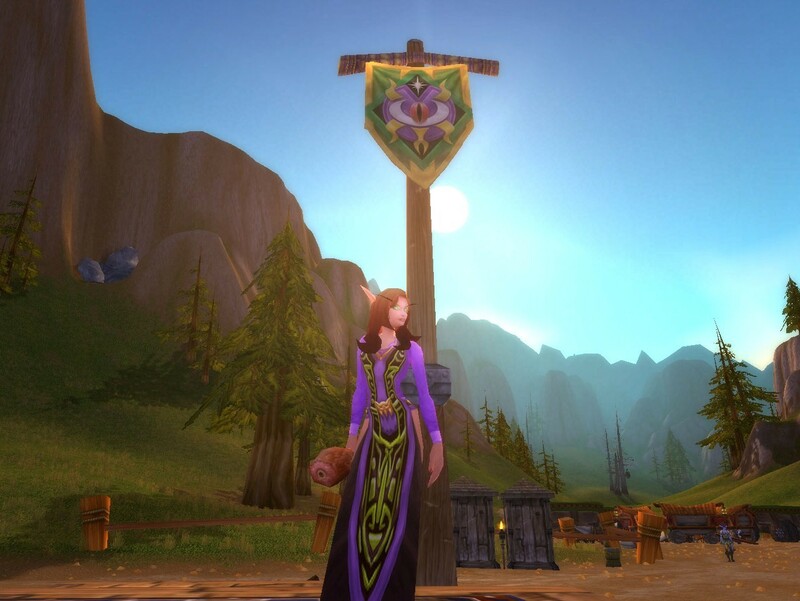 The Darkmoon Vest matches perfectly with the sarong’s darker accents. 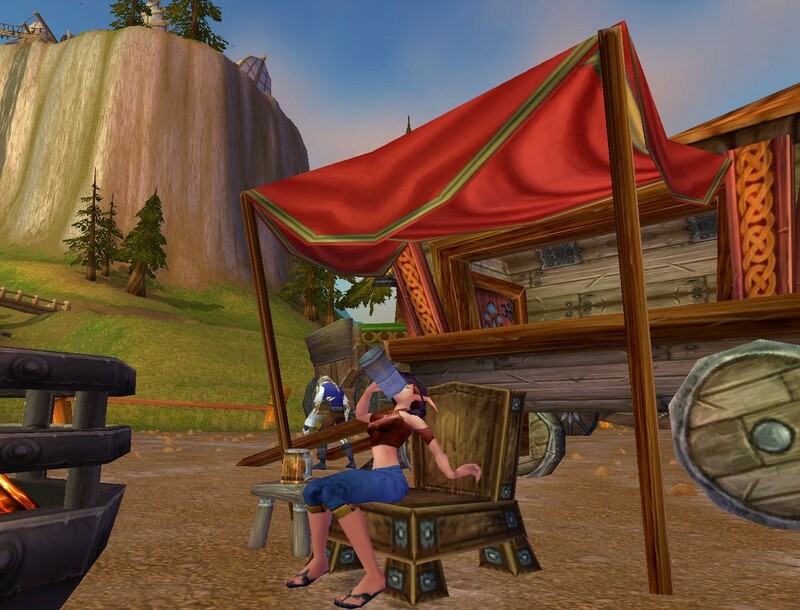 For fall- time festival going, pair the outfit up with the Red Swashbuckler Shirt for matching red sleeves. This robe has a couple of cloth armor twins, the Darkmist Wraps and Elder’s Robes. 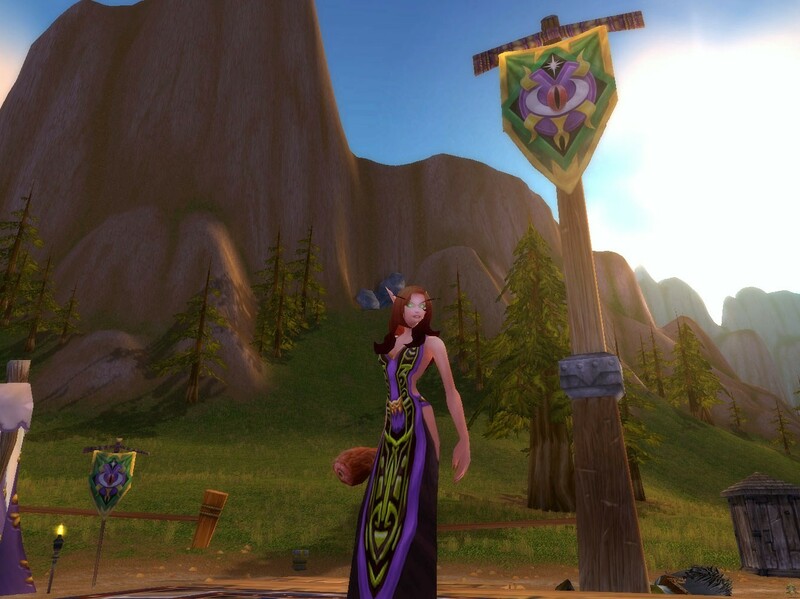 Should it interest anyone, these robes can be worn with shirts underneath for instant matching sleeves. 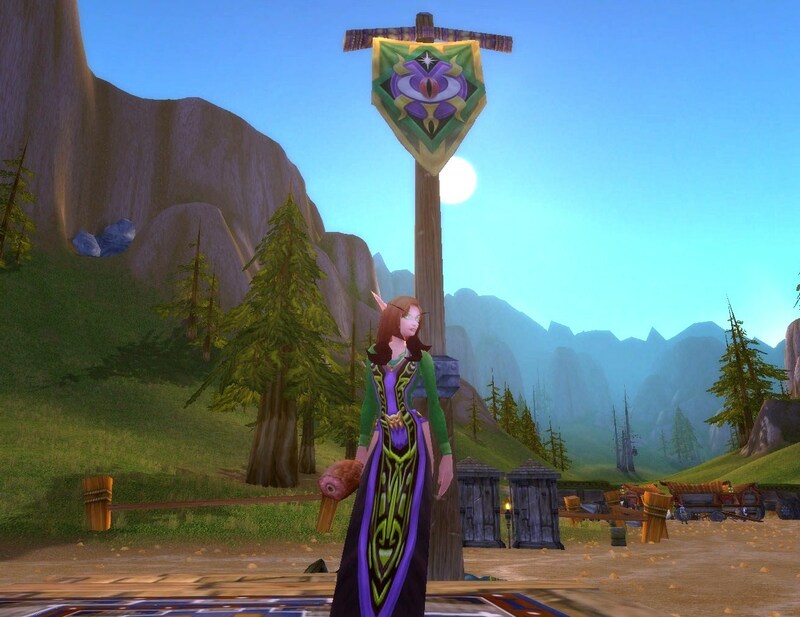 The Lavender Mageweave Shirt blends better with the robe than does the Green Linen Shirt, but, I felt the green from the Darkmoon Faire banner needed to be represented as well ^_^. To end the “dressy” fair outfits are two, yes, Simple Kilt ones. This first one is very simple, but fun. I switched from my previous Emblazoned Hat to the Weather-Beaten Fishing Hat to match the brown in the Twill Vest better. This hat style and color is also found in several other helms, should anyone not have the fishing one. 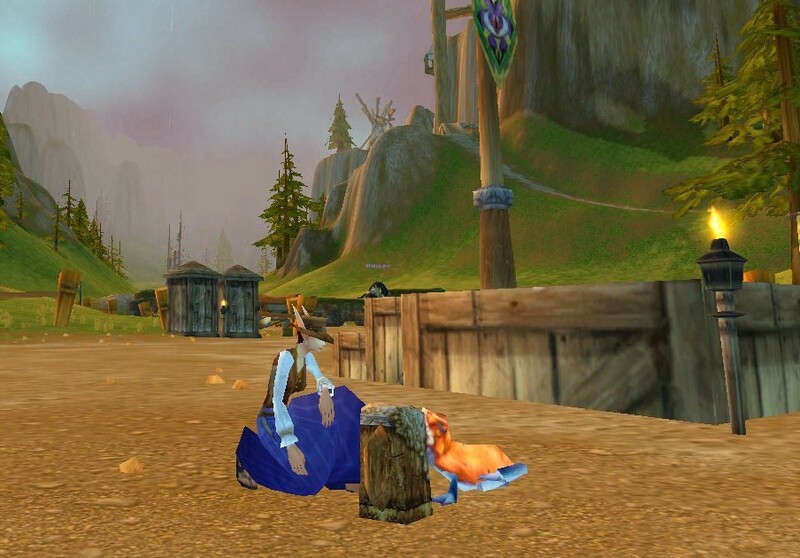 Elder’s Padded Armor is a rare drop around Azeroth, but can used in several different types of outfits once obtained. 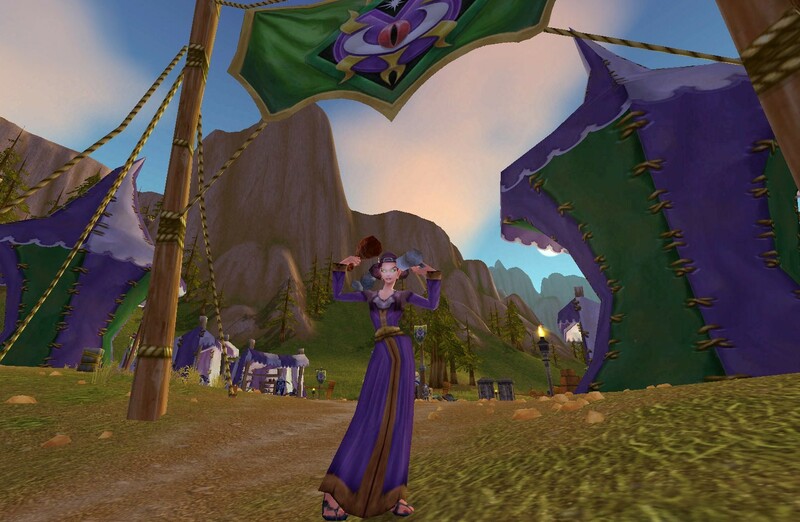 And, if earning 50 tickets for a mutton mace isn’t worth it to you, 5 Darkmoon Faire Prize Tickets can get you a beautiful Darkmoon Flower off-hand to hold while walking around the fair. But who wants to wear a skirt to an outdoor fair? Not that they aren’t cute ^_^, but, I want to be shot out of the cannon! So, here are Kirina’s pant fair-wear. I chose Kirina’s Pink Mageweave Shirt to wear under the Blue Overalls, but anyone of your favorite shirts will also do just fine. This next outfit is the same as the Simple Kilt one, only with a pair of trousers. There are several other capri-like blue jean leggings, such as the Azure Silk Pants (to name one off the top of my head), to wear in replacement of the Royal Trousers . Although, this outfit is where I would prefer to have a pair of Daisy’s Dukes…but that’s a different story. The Interlaced Vest armor design can be found in several other colors, such as the Willow Vest. Again, Daisy’s Dukes (*ahem* Blizzard…these are hints!) would be appreciated for the classic short-shorts and halter outfit. The last outfit also uses a vibrant colored tunic to bring out the fair’s mystical spirit. 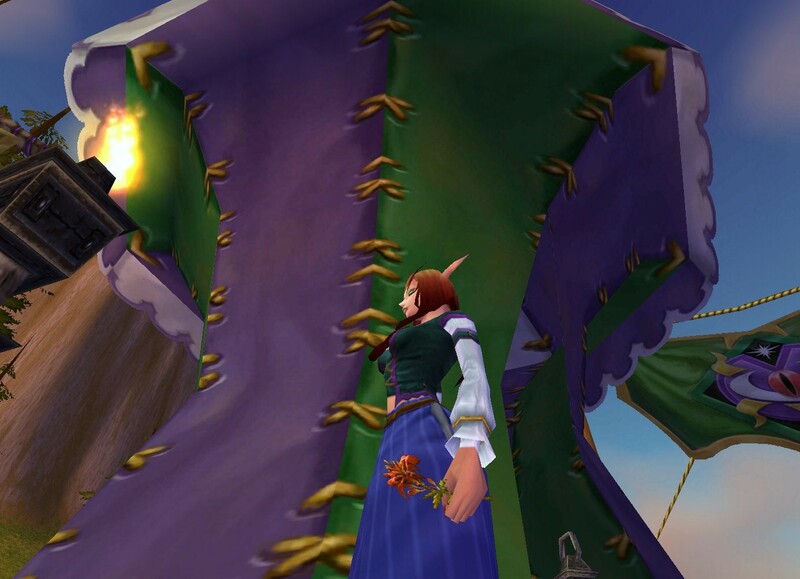 Celestial Tunic is another rare find, but a pretty top, even for general everyday wear. Gossamer Pants are another “lucky drop” piece of gear, but are very decorative brown shorts to own. As I say in all my other articles, the outfits I have listed are by no means the only ones that are fit for wearing when going to the fair; there are endless combinations from the countless pieces of armor that will do just fine, or even better, than Kirina’s. 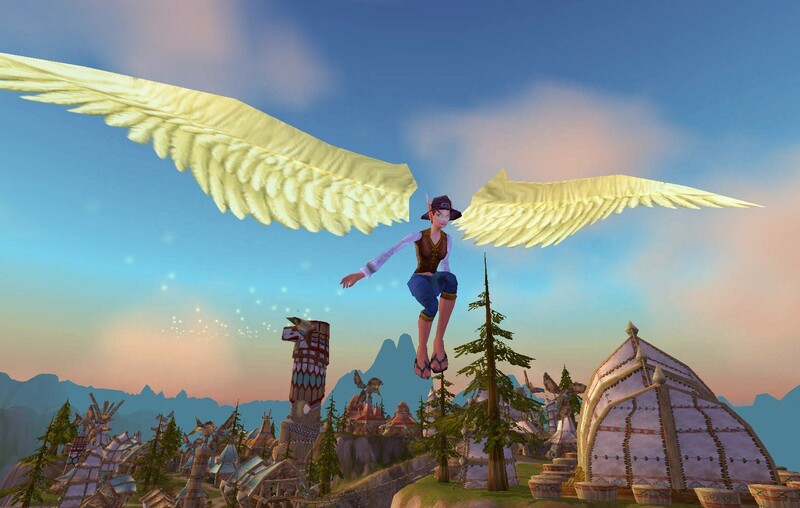 Remember to be creative and have fun with your outfits, and take the time to wear different ones when visiting the Darkmoon Faire.